Retention factor analysis is used to evaluate if the solvent system is adequate. 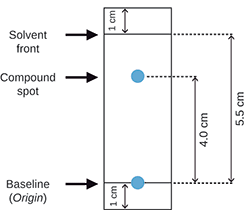 Rf is defined as the distance traveled by the compound divided by the distance traveled by the solvent front. This means: the larger the Rf value of a compound, the larger is the distance traveled by the compound. In other words, when comparing Rf values of various compounds under identical chromatography conditions, the compound with the larger Rf is less polar because it interacts less strongly with the polar adsorbent on the plate. Remember, a good solvent system is one that moves all components off the baseline with Rf values between 0.15 and 0.85 (ideal Rf is 0.2 - 0.4). Otherwise, when possible, it is preferable to chose another solvent system. How to calculate the retention factor? The greater the ΔCV, the greater will be the separation and resolution between the spots (easier separation). A bigger ΔCV will therefore allow more sample to be loaded onto the column.